So, I am only about 10 kills deep in my quest for Reins of the Raven Lord and the daily trips out to tackle Anzu are already getting tiresome. I fly down to Sethekk Halls and prowl my way through the instance, being sure to give Darkweaver Syth a wide berth (he sees through stealth you know). Once I reach Anzu's chamber, regrettably at nearly the end of the level, it is time to clear the trash. Thankfully, you can ignore the back left group, but the others need to be dealt with. I always kill the Prophets first to avoid getting feared. Then it is finally time for Anzu. The big bird is actually more trivial than the add packs that precede him. 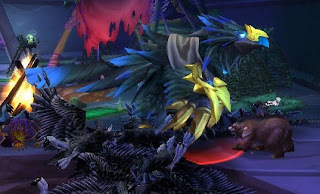 Occasionally he will stun you for six seconds using Paralyzing Screech and at 66% and 33% he will banish himself and call down a flock of ravens called "Brood of Anzu." Thankfully, the damage from the fight is not enough to make up for my Improved Leader of the Pack Aura and death is never really a threat. Even if my gear were weaker or I did not have a Feral Spec, he would still be doable because there is a brief "heal break" every time he summons his adds. So far I have seen two greens and one epic gem. In case you were wondering, I leave the Spirit Shards behind. Here is hoping you will all see a picture of me atop my new Raven Lord mount sooner rather than later. Wow, lucky indeed! I am now well up over fifty kills and have still yet to see the elusive bird.